i can’t believe it. summer has ended. as cliche as this may sound but time does fly so fast. a trip to our province, a few long road trips, a couple of visits to the beach, 3 doctor visits, 1 MRI and dozens of lazy mornings later, it is June. till we meet again, Summer. on another note, i spent my weekend catching up on my favorite blogs and going through my link list when i was utterly heartbroken to find two of my favorite bloggers deciding to discontinue or delete their blogs. Kate of Postcards From…, and Eunice of Hey Fancy Pants — you will be terrible missed. i started this blog nearly the same time you guys did. you were one of the few ones out there who blogged to simply share what you were passionate about — your personal style and whom i found were real and genuine people. seeing how your style flourished with every post and reading about your life helped make the world a lot smaller for me. Aww it's sad when bloggers (especially ones that you love!) decide to end blogging… but I'm sure those ladies, have amazing adventures in store for them. How have you been, G? I hope all is good. Haven't been by in a while. You are still looking lovely as ever. I love this look. The maxi skirt is marvelous!! 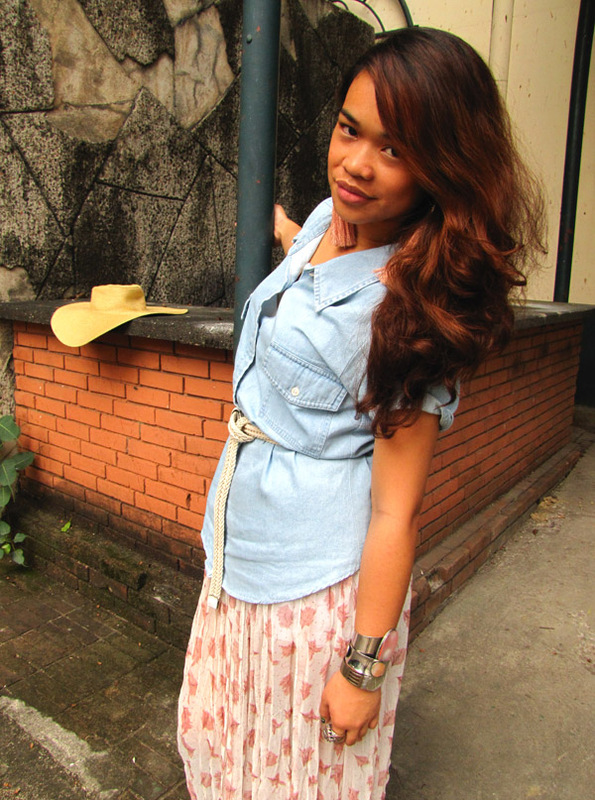 I've been wearing maxi everything lately. 🙂 Well, I hope you are well, my dear! Muah. love that denim button down shirt and your hair! 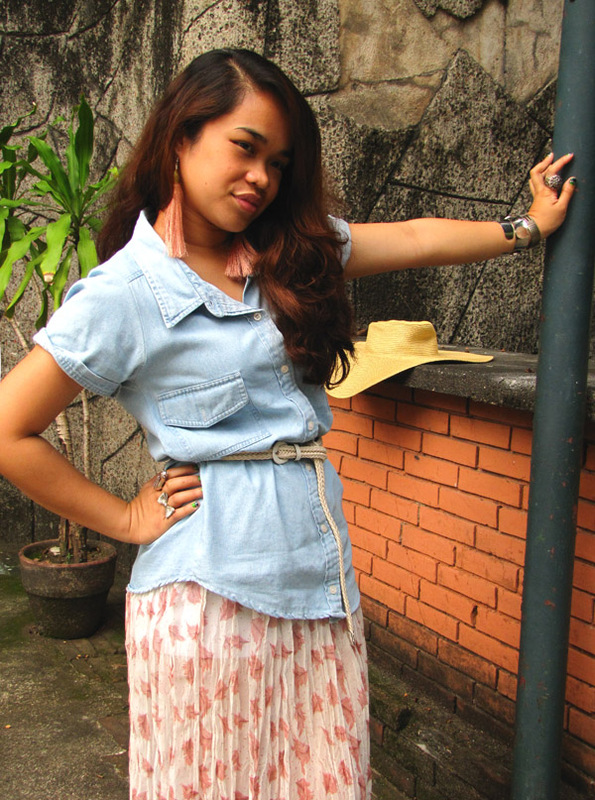 I love the collar of your denim shirt! 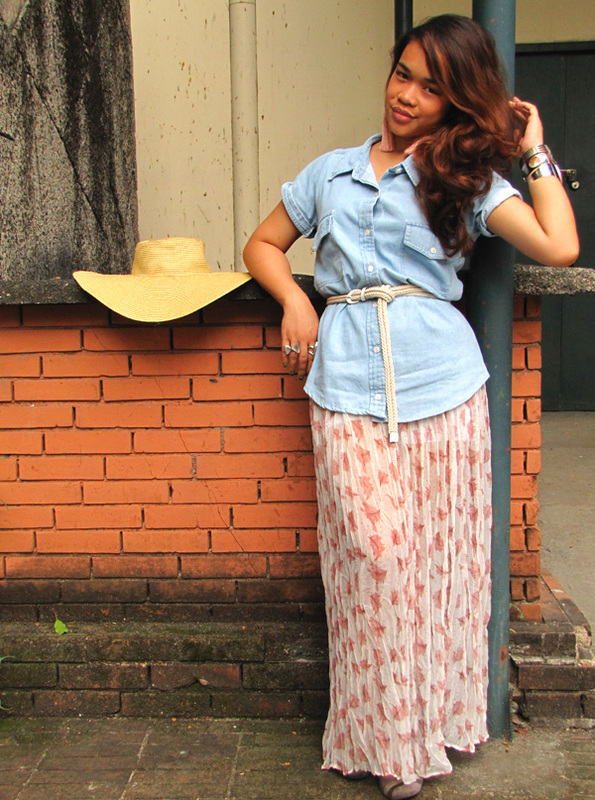 i love how you combined the chambray top and maxi skirt. your hair is gorgeous as usual. i miss commenting on your posts but am your regular reader(as always). good day! Anyway, goodbye summer na bitaw!went to beach once lang.I wish I'm in Cebu kay daghan beaches na lami.here,you have to go to batangas pa or far away places to experience beautiful beach. Your outfit is so fun and laid back! the print of your skirt is so fun,it makes me want to go to the beach! Summer is only beginning here in LA. You look gorgeous and love the maxi skirt!!! I hope things are going well! ooh, love this look Gizelle! HI!my name's martina and I come from Italy… I'd like you visit my blog and if you want… follow me! I wait you and your tips! You combined these items perfectly!